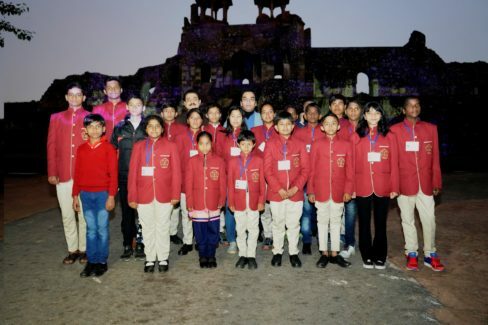 The incredible children, who were bestowed with National Bravery Awards coming from different parts of the country, were welcomed and invited to an exclusive screening of spell bounding Sound and Light show run by India Tourism Development Corporation (ITDC) Ltd at Purana Qila, New Delhi. The Children received the National Bravery awards, for their outstanding acts of courage and tact, by Shri Ram Nath Kovind, Hon’ble President of India. ITDC screened the incredible 1000 years journey of rise and fall, shaping of the capital city ‘Delhi’ through mesmerizing Sound & Light show ‘Ishq-e-Dilli’ for the brave hearts. Present on the occasion were Shri Piyush Tiwari, Director (Commercial & Marketing), ITDC; Mr. Ravi Pandit, Vice President, Engineering, ITDC; Mr. Suresh Chandra, Head, Sound & Light Show Division, ITDC and other officials from the organization. Speaking at the felicitation ceremony, Shri Piyush Tiwari, Director (Commercial & Marketing), ITDC said, “It is a proud moment to be among & interact with youth of India, whose hearts are filled with vigor and righteous courage to choose and do right at such tender age. These young Indians have showcased highest level of humanity by valuing others life and fighting their fears to protect others. They are real heroes of our nations. It is indeed an honor for ITDC family to host and meet these extraordinary children at the Son Et Lumiere (Show)”. This year, the National Bravery Award was also merged with the Bal Shakti Puraskar. The awardees were selected from 900 applications received through a special portal created for the purpose. The winners were selected through a rigorous process of critical analysis by a committee comprising experts from varied disciplines such as sociology, psychology, mathematics, science, art, music and sport.